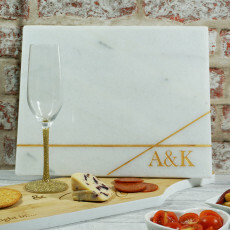 A stunning round marble cheese board makes a beautiful gift for any occasion. Looking for a brilliant statement piece for a big event? Or know someone who has a vast collection of cheeses they like to show off? 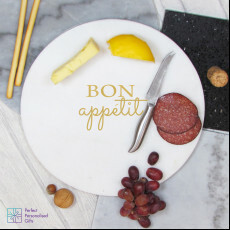 This Initial Round Marble Board is the most wonderful gift. Whether it’s for a special occasion like Christmas, Weddings, Anniversaries or as a simple gift like for a new home, it can be given for any occasion. 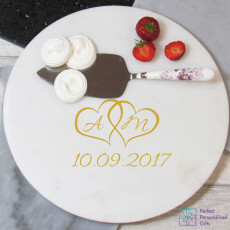 This marble cheeseboard is engraved with personalised initials and then hand decorated with gold. The board is food safe and dishwasher friendly. You can choose to get this cheese board gift wrapped with a black gift box, black shredded tissue paper and finished with a black satin ribbon making this a truly beautiful gift. It is approx. 33cm. Shopping last minute? Don’t worry, just select next day delivery when you order!